Commissioned by the Parish Council, based largely upon Council Minutes and written by C. W. Clark. 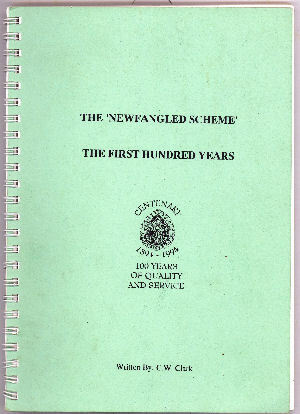 The book includes a list of Chairmen of the Parish Council, and names of the Parish Clerks. Abbots Langley in 1894 was considerably different from what it is today. Vicar Parnell was in only the second year of his 32-year vicariate. As if to remind us of the farming origins of the parish, that April sheep were put into the churchyard to feed down the. grass around the graves. The Civil Parish which the new Council was responsible for was 5,281 acres in extent, boot-shaped and stretched from Chambersbury Lane to Leavesden, and from East Lane to Bucks Hill. The population in 1891 totalled 3,230. The Village was fast joining up wi th the hamlets of Kitters Green and Trowley Bottom, but there were fields between it and all the other settlements of the parish - Bedmond, Hunton Bridge, Upper Highway/Gallows Hill, Primrose Hill and Nash Mills. The main landowners were still the absentee Lords of The Manor of Abbots Langley (Trinity College, Oxford and Sidney Sussex College, Cambridge) along with E. H. Loyd of Langleybury, H. R. Solly of Sergehill and Sir John Evans. The large houses of the parish - Hazelwood (now Hunton Park), Hillside, Rosehill, Manor, Causeway, Abbots, Langley and Cecil Lodge - were all still private residences. The main lines of local communication, for anyone going a distance were still the old turnpike road (now A 41), the canal and the railway, all of which were a good half-hour's walk away. The men of the parish, if they lived towards the Gade Valley, worked in the Dickinson paper mills: if they lived near the Village, at either the Leavesden Asylum or the St. Pancras Workhouse Schools (till recently, Abbots Langley Hospital) opposite; if to the north and west of the Village, on local farms. In the Village proper, the High Street stretched from Langley House (later Breakspeare College) down to the King's Head. Below that on that side, the 'plantation' of trees that shielded the grounds of Langley House from public view, ran on unbroken down to where the Scouts' headquarters now is. On the other side, the Church side, the High Street extended down to the Bricklayers Arms public house only. The Land Company roads, laid down about 1870 between the Village and Kitters Green Adrian, Breakspear, Popes and Garden - were in 1894 by no means full of cottages. Abbots Road (originally 'the new road leading to Kings Langley Station') also laid out by the Company, was still referred to by many as 'the new road'; but apart from its dozen cottages at the top end it had but three houses along the rest of its entire length. There was no electricity at the Village. The Hunton Bridge & Abbots Langley Gas Co. supplied its product only to the large houses as far as Cecil lodge, the High St. gas-lamps (four in number), the Church and the National Schools. Cottagers used oil-lamps. Only the Village centre had a sewage system, recently installed. Its water came from Hunton Bridge, carried up by the Abbots Langley Waterworks Company. As all but some estate villages went at that time, Abbots Langley in 1894 was one of the better-equipped. It still had a long way to go, and needed a great deal of tending, however, before it became as comfortable or as safe to live in as the towns. A common jibe of the time, much cherished in Redmond and the hamlets, was that "one half of the people in Abbots Langley are daft, and the other half look after them!" It was largely true: the place was different then.